In our new series ‘Theory Thursday’ we will discuss general business theories and practices. The topics will include: overall business management, social media and content marketing, creating and maintaining your brand voice, networking, measuring analytics, and much more! 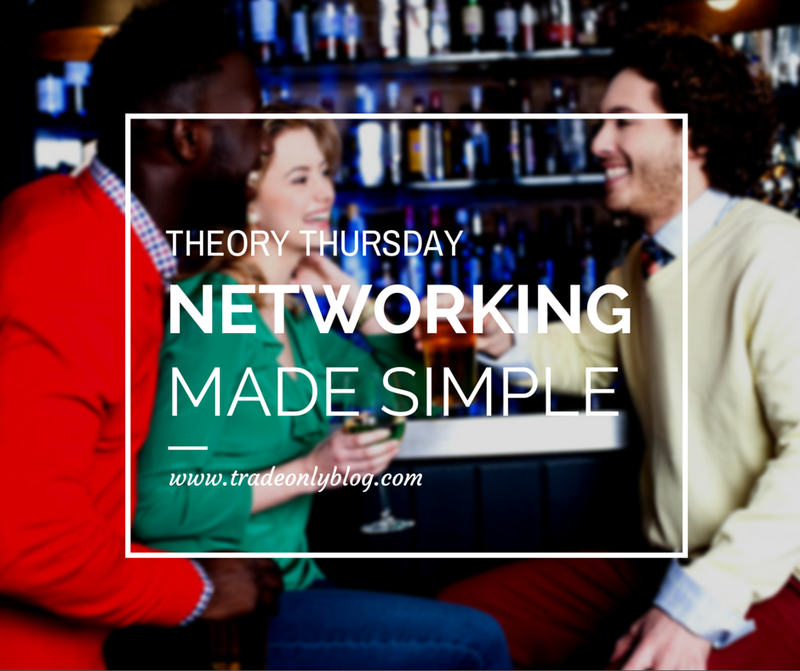 In today’s Theory Thursday blog, I will address the topic of networking; that dreaded term we hear so often on LinkedIn or at the prospect of a trade show. My goal for the end of this blog is to make you feel more confident and comfortable working a room, making connections, and pitching your business. If you haven’t yet read our blog “How to Pitch Your Promotional Products Business,” I suggest you spend a few minutes skimming the article and participating in the ‘creating your pitch’ exercise so you have a firmer grasp on just how awesome your promo business really is! Assuming, now, that you’ve read our blog, you now have a firm grasp on the qualities and features that make your business (and your role in the business) unique. Good news! That is half of the battle; the other half of the battle consists of surpassing those obstacles of social anxiety, spotlight pressure, and performance anxiety. If the sound of those words ricochet off the sides of your brain making you feel overwhelmed, fearful, and completely dreadful… You’re in the right place. I want you to try to relinquish any description of ‘networking’ you have tucked into the forefront of your mind, at present. Let’s start with a clean slate. Because networking shouldn’t be a dreaded and mandatory evil. Here’s a better, more accurate definition of networking: An opportunity to make friends with a group of people you otherwise wouldn’t meet in your day to day life. You must be thinking: that is ridiculous, it is work, not speed-dating. I agree. But, what people so frequently do in business, is dehumanize the entire process. Businesses are comprised of employees. Employees are human. Humans are emotional beings. Therefore, businesses are emotional beings. How do you like that deductive reasoning, Descartes? From now on, I want you to address all networking events as ‘social’ events. That’s what you are going to be doing: socializing. So, unless you absolutely love awkward silences because you are some sort of succubus that feeds off of awkwardness, one of you needs to break this completely weird vibe. Me: Hello, my name is Parris. What’s your name? Them: My name is Bob. Nice to meet you. Them: Well, it was nice to meet you! Don’t do this to yourself. Or anyone else, it’s painful. You have to be that person. The person that is your outgoing self, asking questions that seem completely impertinent, but completely engaging. I have found over the years that being completely outgoing and borderline overwhelming, is always the best way to go. It attracts attention, it engages your audience, and it makes people feel more comfortable in a stiff situation. Use the ‘What do you do?’ question (from this point forward it will be referred to as ‘the question which shall not be named’) as your absolute last resort. Bring along your favorite personal trinket, or wear a ‘conversation starter’ article of clothing (I generally lift up my sleeves at a networking event, showcasing my Darth Vader tattoo). Carry lots of business cards with you. Bring breath mints with you; often social events coerce individuals into close proximity. The more questions you can ask the other person, the better. Build off of each question, and get to know the other person more than just surface level. Use your phone or your iPad to take pictures with people or groups of people. This allows you to connect with people later in a unique, as you tag them in the pictures. Be yourself; don’t put on a business facade. Personality wins over ‘prim and proper’ every single time. How are you enjoying this event so far? I’m craving ________. How about you? I wish this event was in the morning, I’m more of a morning person… How about you? Which do you prefer: Apple or Android (Google)? How stuffy is this room? Met anyone interesting? I need caffeine! You want to walk with me to grab some coffee? Do you have any children at home? How old? What are their names? Did you read about the _________________ in the newspaper this morning? Insane! I wish they served different food… What is your favorite food? I like your __________. Where did you get it? Remember you are talking to people at networking events. Ask questions that are not necessarily business-related to break the ice, and only talk about what you do when asked. Let your personality shine, don’t try to be something you are not…. and most importantly: have fun meeting new people!